We were recently gifted a beautiful 6ft Nordmann Fir Christmas tree and stand by The Christmas Forest, which arrived last week. 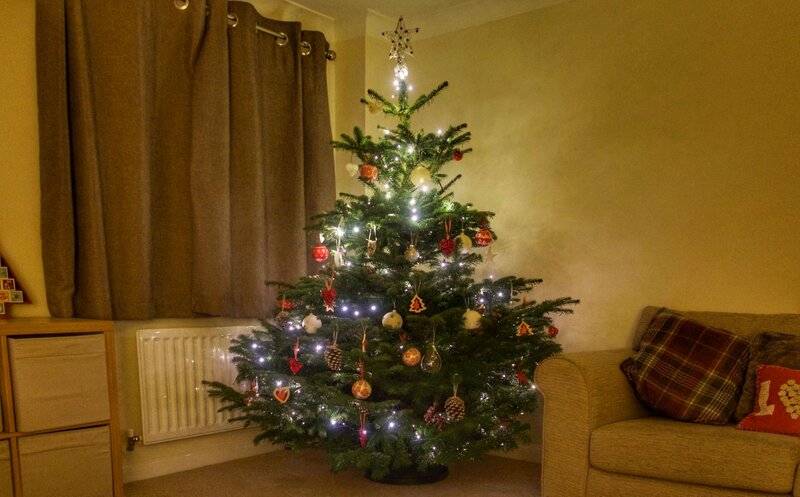 I was so excited to have a real Christmas tree as, aside from a few years ago when I rescued the school one which was going to be shredded, we’ve always had an artificial tree. 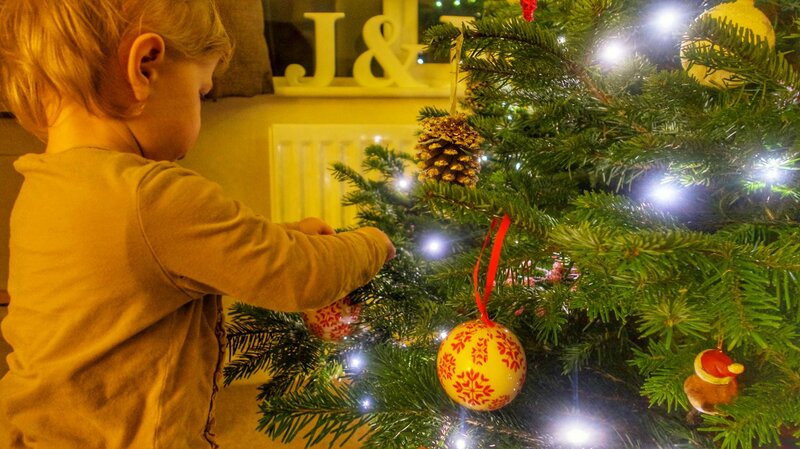 I don’t know if it’s because M is old enough to understand Christmas a little more this year, or if it is because of the real tree, but decorating the tree felt a little bit extra special this year. 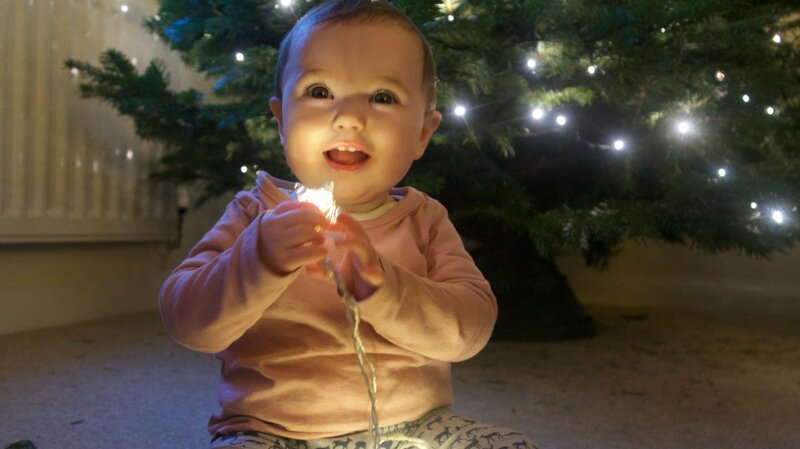 B crawled around exploring the different boxes and playing with fairy lights, while M delighted in discovering the different baubles and hanging them on the tree. Since Matthew and I started our relationship nearly eight years ago, we’ve slowly added to our collection of Christmas decorations. Many of them have strong sentimental value to us. We can remember where we were and what stage our relationship was at when we bought them. There’s the little robin purchased at the first Christmas market we visited together in Birmingham, before we even lived together; the wooden elk we bought from Skansen, the open-air museum and zoo in Matthew’s favourite city, Stockholm; the little metal hearts that we had pinned to trees at our wedding venue. I think in the past we’ve always opted for an artificial tree because it’s been what we’ve both grown up with, and felt like the easy option. But The Christmas Forest definitely took the stress out of finding the perfect tree. You can choose your own from one of their London stores and take it home yourself. Or if you live outside London, like us, then you can opt for a home delivery option. 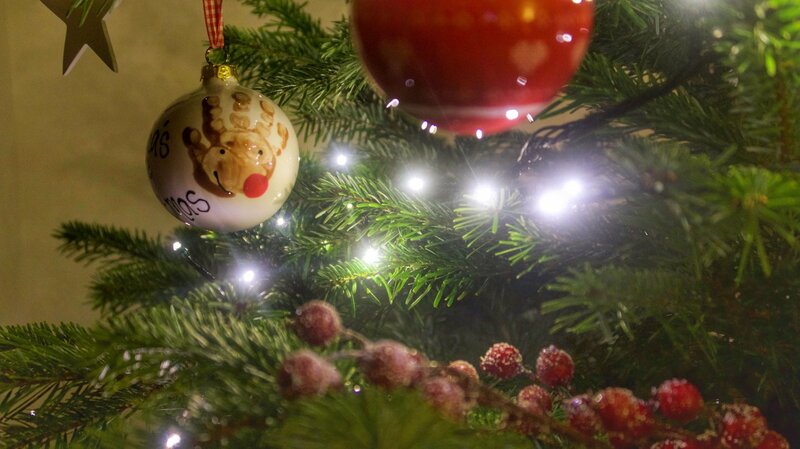 Home delivery happens on a nominated day and the tree will be delivered at any time up to 6pm. Our tree arrived well wrapped and came with a water-holding stand, which can be purchased separately. 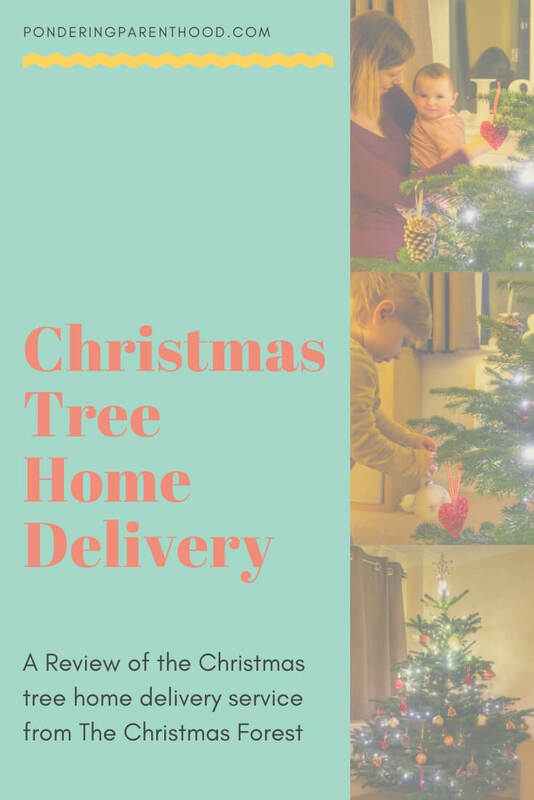 My only negative about the whole process is that the delivery man declared that he wasn’t allowed inside my house, and left me holding both a baby and a 6ft tall fir tree. The Christmas Forest have explained that this is because delivery is outsourced so drivers aren’t allowed to unpack trees for my tree’s care and safety. I don’t think I would have had such a problem with this if my living room wasn’t upstairs, and I hadn’t been so excited and impatient to get my tree up! Once Matthew got home from work, he brought the tree upstairs and we unpacked it together. The tree is packaged in both a net (like the ones you see trees in at garden centres) and a plastic bag. It was certainly well protected and looked and smelled amazing once it was unpacked. The tree is a beautiful shape and while it did drop a lot of needles when we unpacked and decorated it, since that initial drop it has lived up to its premium, non-drop claims. I think this is helped by the fact that we followed the instructions that came with the tree, and cut off the bottom 10mm of the trunk before putting it into the stand. We have also made sure to water it every day, keeping the reservoir in the stand topped up. 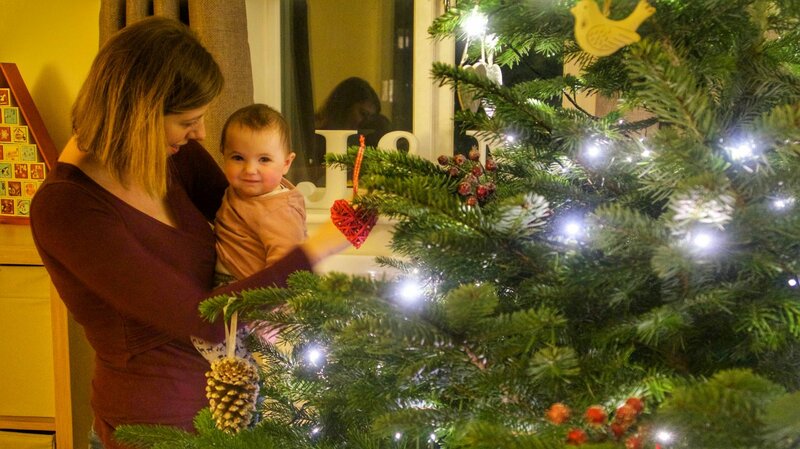 We’re really happy with our Christmas tree from The Christmas Forest, and can’t wait to enjoy the rest of advent. 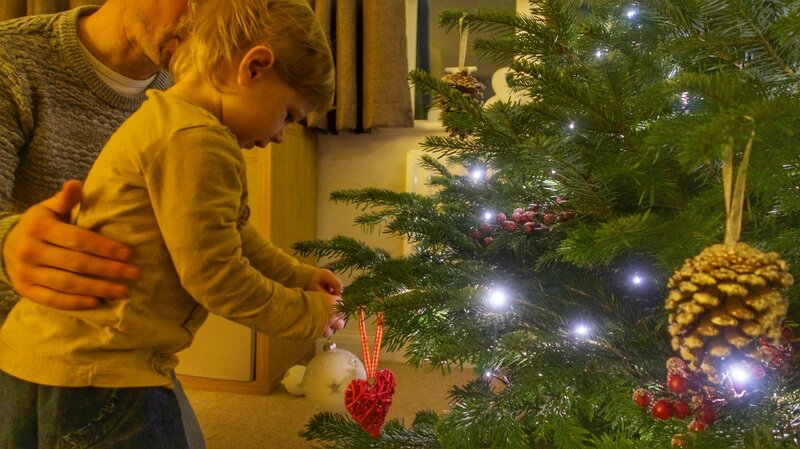 I think the combination of a real tree and a toddler is going to make it extra special and magical this year! *Disclosure: We were sent our Christmas tree and stand by The Christmas Forest free of charge, in order to provide this honest review. "Pondering Playtime // Christmas Lolly Stick Reindeer Craft"